Nothing can prepare you for a reel this light, compact and maneuverable with the raw power to move fish out of cover at will! It's a whole new approach to all-day bassin', based on a superlight magnesium frame and sideplates paired with the acclaimed Magnumlite A7075 aluminum spool. For pure castability, great handling, and all-around strength, the Core is unmatched. S-A-RB bearing system including Super Stopper anti-reverse; High Efficiency Gearing technology; tapered titanium levelwind insert; Super Free Variable Brake System; Dartainium Drag; Septon grips. The FV model is a high-speed flipping version with Instagage II thumb bar. "Ive been fishing shimano rods and reels ever since my dad gave me my first shimano combo. 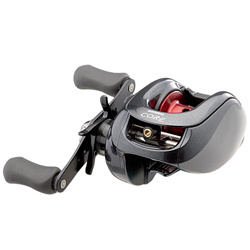 This reel is great!,Its super light and casts really far. If you can spare the money, Pair this reel with the shimano cumara rod." "This reel is awesome. Works great, weighs nothing. Might be expensive but its worth it. I matched it with a cumara 6'8 mh. Five star all the way!!!" "Purchased the 7:1 went it just came out, and paired with a Kistler 7foot med rod and 20lb braid, I can throw a weightless yum dinger all day and the switch and even throw a crank bait, yes a little pricey of a reel but you work hard and live once so enjoy something this good"
"The Core reel is light and I honestly outside of weight found that it did not gain on my Curado 100. I heard a lot about this reel and tried it . For the money, I am going to stay with my first choice."